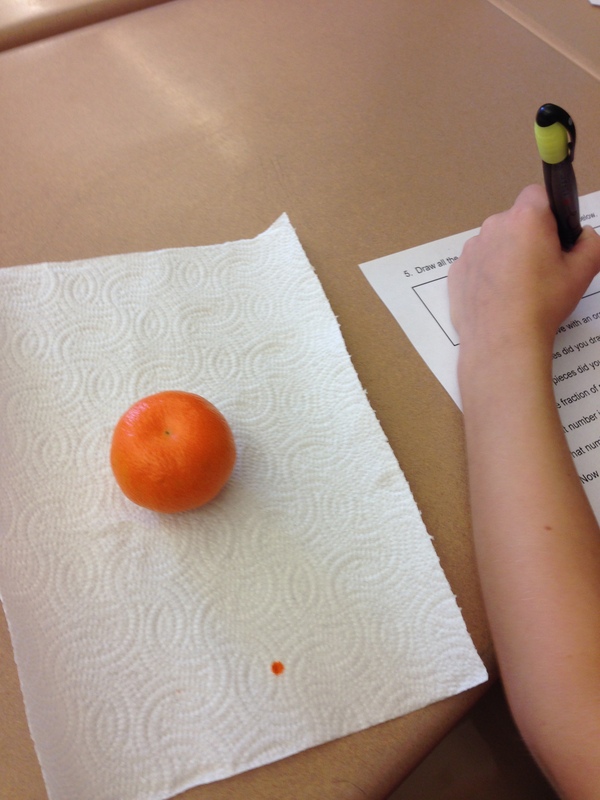 Today’s second grade math lesson included an introduction to fractions. 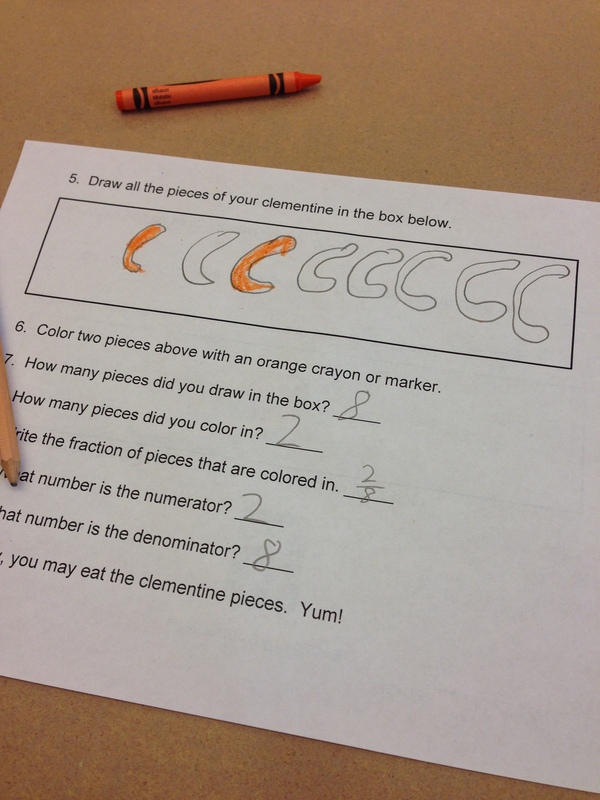 In the past I’ve introduced our fraction unit with pie manipulatives. They work great, but I was looking for a more hands-on lesson that motivated as well as provided opportunities for enrichment. While thinking about how I could make my fraction lesson more engaging, I decided to research a few different options. Specifically, I wanted to find a way to incorporate a lesson with multiple answers. I thought what’s healthy (district wellness plan), easy to peel, has different sectional pieces, and is relatively easy to clean up? I ended up deciding on purchasing a bag of clementines. I also put together this sheet for the activity. The lesson went well and it’s definitely one that I’ll keep in the repertoire. 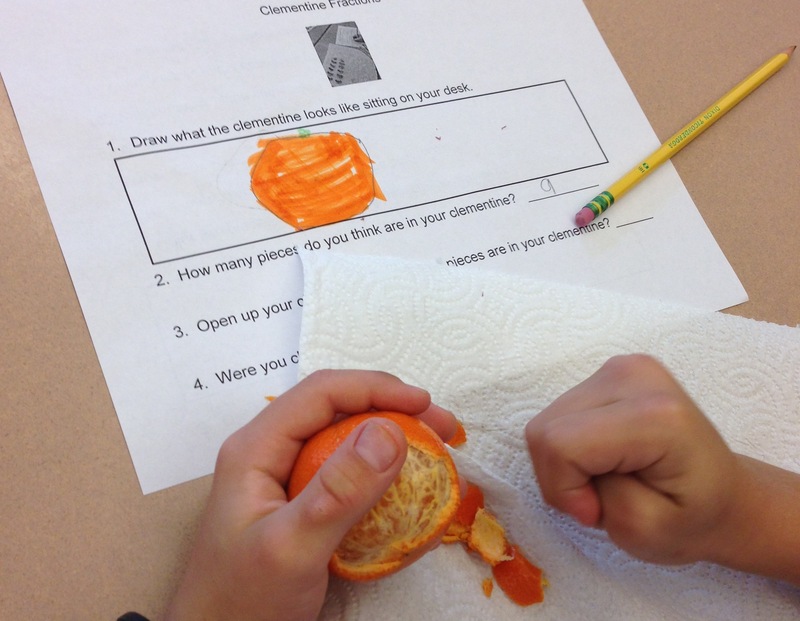 Students estimated the amount of slices, identified fractional pieces, found the numerator/denominator, turned the fraction into a mixed number and finally ate the clementine. A few pictures are below. How do you introduce fractions? What a grt activity. I so agree that circles or pies are not the best way of introducing fractions. It is so hard for students to compare and figure out fractions with Circles. I have used fraction strips and then played games with those fraction strips. Marylin burns has a grt resource on fractions. Yes, Marilyn Burns is definitely a useful resource. The fractional circles also drive me a bit crazy, especially if students haven’t been introduced to percents or angle measurements. All in all though, It was exciting to have a math lesson that didn’t involve the textbook. Thanks for the comment.